In an age of Al Qaeda—of terror and insurgent fundamentalisms—we have grown accustomed to thinking of the world as divided among warring creeds and cultures, separated from one another by a chasm of incomprehension. In Cosmopolitanism, Kwame Anthony Appiah, one of the world’s leading philosophers, challenges us to redraw these imaginary boundaries, reminding us of the powerful ties that connect people across religions, culture and nations … and of the deep conflicts within them. 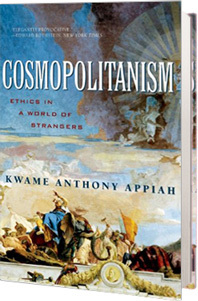 Finding his philosophical inspiration in the Greek Cynics of the fourth century BC, who first articulated the cosmopolitan ideal—that all human beings were fellow citizens of the world—Appiah reminds us that cosmopolitanism underwrote some of the greatest moral achievements of the Enlightenment, including the 1789 declaration of the “Rights of Man” and Kant’s proposal for a “league of nations.” In showing us how modern philosophy has led us astray, Appiah also draws on his own experiences, growing up as the child of an English mother and a father from Ghana in a family spread across four continents and as many creeds. Whether he’s recalling characters from a second-century Roman comedy or a great nineteenth-century novel or reliving feasts at the end of Ramadan with his Moslem cousins in the kingdom of Ashanti, Appiah makes vivid the vision his arguments defend. These stories illuminate the tough questions that face us: How is it possible to consider the world a moral community when there’s so much disagreement about the nature of morality? How can you take responsibility for every other life on the planet and still live a life of your own? Appiah explores such challenges to a global ethics as he develops an account that surmounts them. The foreignness of foreigners, the strangeness of strangers, these things are real enough, but Appiah suggests that intellectuals and leaders, on the left and the right, have wildly exaggerated their significance. He scrutinizes the treacly celebration of “diversity,” the hushed invocations of he “Other,” and the brow-furrowing talk of “difference.” In developing a cosmopolitanism for our times, he defends a vision of art and literature as a common human possession, distinguishes the global claims of cosmopolitanism from those of its fundamentalist enemies, and explores what we do, and do not, owe to strangers. This deeply humane account will make it harder for us to think of the world as divided between the West and the Rest, between locals and moderns, between Us and Them. —Samantha Power, author of “A Problem from Hell”: America and the Age of Genocide. —Kofi Annan, former United Nations Secretary-General.